Maura Murray disappeared on the evening of February 9, 2004 after a car crash on Route 112 in Haverhill, New Hampshire. Murray was a nursing student at the University of Massachusetts Amherst. On the afternoon of Monday, February 9, before she left campus, she emailed her professors and work supervisor writing that she was taking a week off due to a death in the family. No one in her family has been able to confirm the family death. Police initially treated her case as a missing-person investigation as investigators thought at first that she wanted to disappear. This speculation was due to her travel preparations and no obvious evidence of foul play. Others believe she was abducted. Some time after 7:00 pm, a Woodsville, New Hampshire resident heard a loud thump outside of her house. Through her window she could see a car up against the snowbank along Route 112, also known as Wild Ammonoosuc Road. The car pointed west on the eastbound side of the road. She telephoned the Grafton County Sheriff's Department at 7:27 pm to report the accident. At about the same time another neighbor saw the car as well as someone walking around the vehicle. She witnessed a third neighbor pull up alongside the vehicle. That neighbor, a school bus driver returning home, noticed Maura Murray was not bleeding but cold and shivering.He offered to telephone for help. She asked him not to call the police (one police report says "pleaded") and assured him she'd already called AAA. (AAA has no record of any such call.) Knowing there was no cell-phone reception in the area, the bus driver continued home and called the police. His call was received by the Sheriff's Department at 7:43 pm. He was unable to see Murray's car while he made the phone call but did notice several cars pass on the road before the police arrived. At 7:46 pm, a Haverhill police officer arrived at the scene. No one was inside or around the car. Inside and outside the car he discovered red stains that looked to be red wine. Inside the car the officer found an empty beer bottle and a damaged box of Franzia wine on the rear seat. In addition, he found a AAA card issued to Murray, blank accident-report forms, gloves, compact discs, makeup, diamond jewelry, two sets of MapQuest driving directions (one to Burlington, Vermont, another to Stowe, Vermont), Murray's favorite stuffed animal, and Not Without Peril, a book about mountain climbing in the White Mountains. Missing were Murray's debit card, credit cards, and cell phone, none of which have been located or used since her disappearance. Murray has never been found. UNPLEASANT FACT: There is a parasite that destroys the tongue of a fish and then replaces the tongue with its own body. 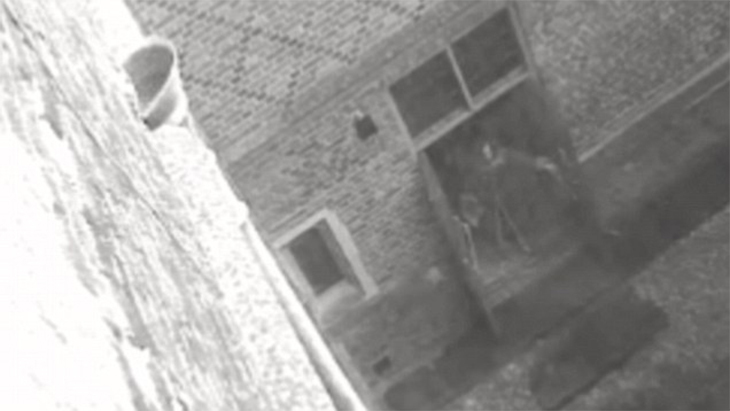 This image was still from a footage caught by the Hampton Court palace’s security camera. A ghostly figure appears to be closing the door, but when the guards arrived, they found no one there. The Hampton Court is a royal palace in London. It had a history of violence. The ghost was believed to have been that of the one being reported to haunt the place. Woke up one night to a loud screeching noise, similar to the screech the nazgul make in LOTR. The entire room was flashing rapidly in bright colors, my computer turned on for a split second, enough to get the fans rattling, and my computer screen had static on it. The entire ordeal was over in less than a second. I still don't know if it really happened or if my brain was just playing me tricks.